Activists from a Moscow human rights watchdog visited the suspects in the murder of opposition leader Boris Nemtsov and said they did not see signs of torture having been applied to those arrested. 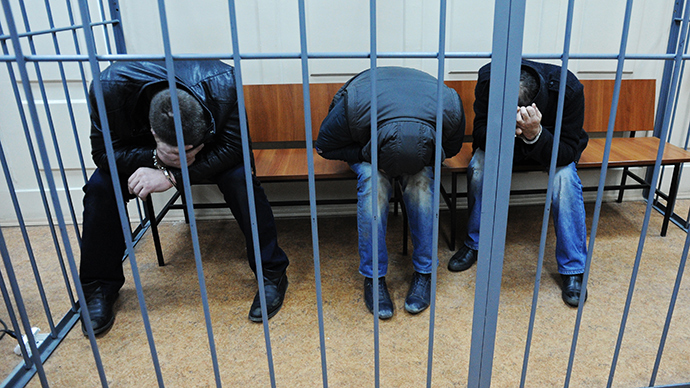 The visit was in the wake of earlier allegations of violence being applied to suspects Zaur Dadaev, Anzor Gubashev and Shagid Gubashev following their detention. He nevertheless refused to draw any immediate conclusions. “We want investigators to thoroughly check this,” Tsvetkov added. Russia's Investigative Committee announced on Wednesday it was looking into the matter. “If the accused file complaints of violence being applied to them, those will be thoroughly investigated,” IC’s press service announced on Wednesday. A day earlier, two human rights activists, Andrey Babushkin and Eva Merkacheva, both members of PMC, visited Lefortovo and met with the suspects in Nemtsov’s murder. They said the accused men complained of having been beaten and left without food following their detention. Babushkin, who is also a member of the Presidential Council for Civil Society and Human Rights, said in his blog that “multiple injuries” could be seen on the bodies of Dadaev and Gubashev. Tsvetkov’s team of activists has doubts, however, saying that bruises and sores are quite commonly inflicted during detention. “Zaur Dadaev says he was tortured, including by means of electric shocks, but we examined his body and found no traces of it, no burns,” he said. Shagit Gubashev says his brother Anzor was beaten with a baseball bat after detention, but Anzor himself denies that, according to Tsvetkov. Besides, no injuries that could be inflicted by a bat were found on Anzor’s body, the activist adds. The chairman of the PMC said all the three suspects he visited, Zaur Dadaev, Anzor Gubashev and Shagid Gubashev, deny their guilt. It was earlier reported that Dadaev confessed to being involved in the murder. The Investigative Committee has meanwhile said it would look into why the activists Babushkin and Merkacheva demonstrated interest in the details of the investigation while that was “in violation of the law,” according to the Investigative Committee’s press service. Boris Nemtsov, who was 55, occupied senior government posts under President Boris Yeltsin and afterwards became an opposition leader. He was shot dead on February 27 near the Kremlin in central Moscow. The assassination, which occurred two days ahead of an opposition rally Nemtsov helped to organize, triggered a flurry of condemnations and calls for a swift investigation. Thousands of people across Russia joined rallies in commemoration of the slain politician. Five suspects in the murder were arrested March 8.